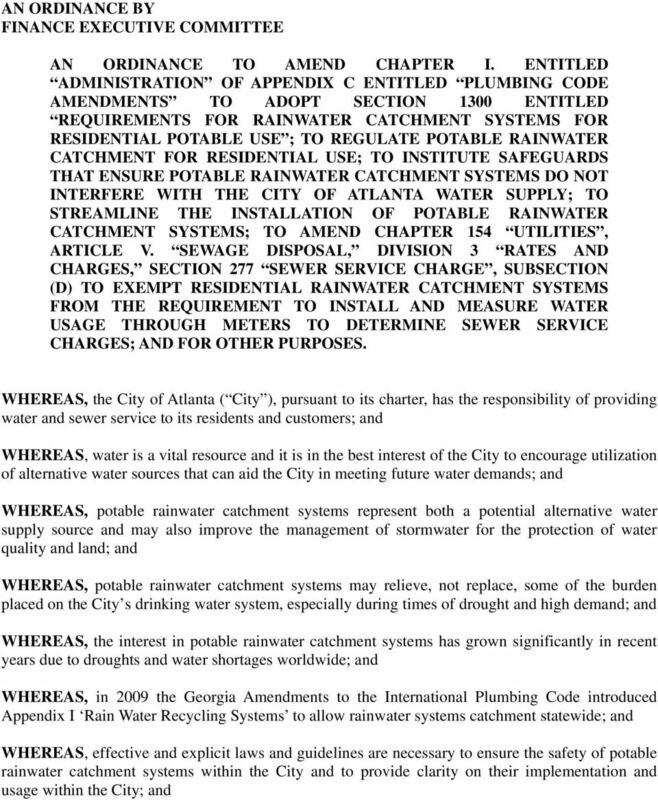 Download "AN ORDINANCE BY FINANCE EXECUTIVE COMMITTEE"
2 NOW THEREFORE, BE IT ORDAINED BY THE CITY COUNCIL OF THE CITY OF ATLANTA, as follows: SECTION 1: That a new Section 1300 Entitled Potable Rainwater Catchment Systems of Appendix C Plumbing Code Amendments, Chapter I. Administration is hereby added to read as follows: Preliminary Information. (a) An individual seeking to install a potable rainwater catchment system shall request approval from the City of Atlanta. 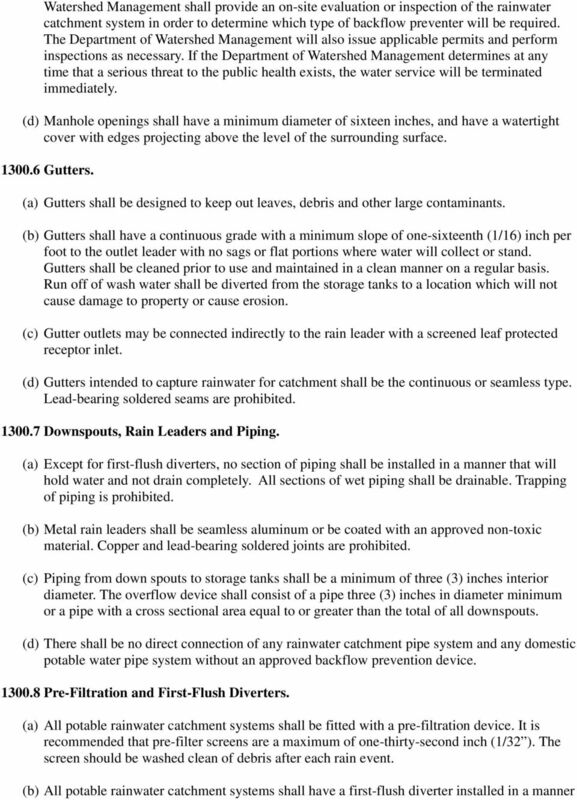 A building official or inspector shall recognize the installation of potable rainwater catchment systems in accordance with this appendix. 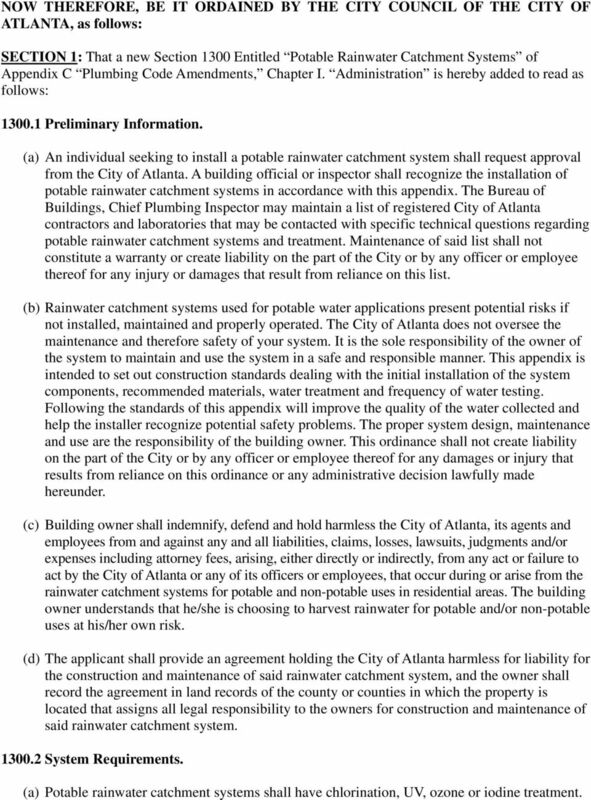 The Bureau of Buildings, Chief Plumbing Inspector may maintain a list of registered City of Atlanta contractors and laboratories that may be contacted with specific technical questions regarding potable rainwater catchment systems and treatment. Maintenance of said list shall not constitute a warranty or create liability on the part of the City or by any officer or employee thereof for any injury or damages that result from reliance on this list. (b) Rainwater catchment systems used for potable water applications present potential risks if not installed, maintained and properly operated. The City of Atlanta does not oversee the maintenance and therefore safety of your system. It is the sole responsibility of the owner of the system to maintain and use the system in a safe and responsible manner. 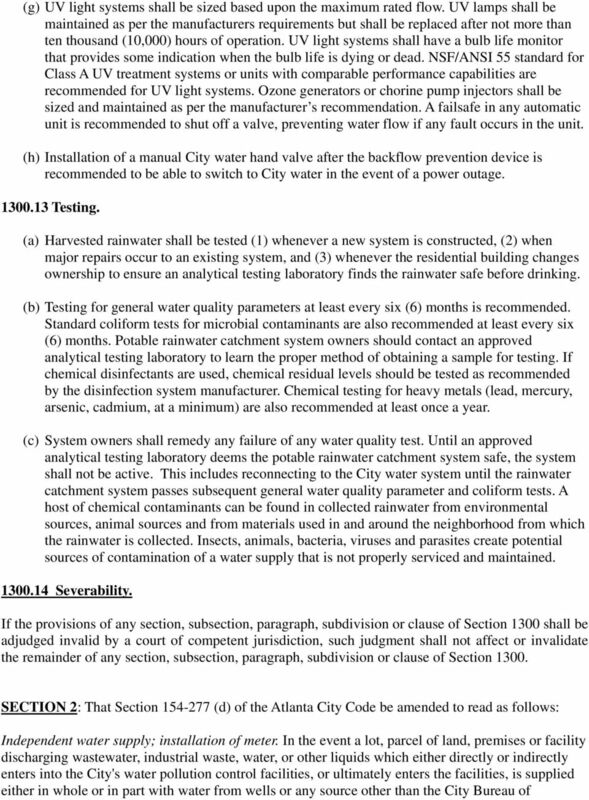 This appendix is intended to set out construction standards dealing with the initial installation of the system components, recommended materials, water treatment and frequency of water testing. Following the standards of this appendix will improve the quality of the water collected and help the installer recognize potential safety problems. The proper system design, maintenance and use are the responsibility of the building owner. This ordinance shall not create liability on the part of the City or by any officer or employee thereof for any damages or injury that results from reliance on this ordinance or any administrative decision lawfully made hereunder. (c) Building owner shall indemnify, defend and hold harmless the City of Atlanta, its agents and employees from and against any and all liabilities, claims, losses, lawsuits, judgments and/or expenses including attorney fees, arising, either directly or indirectly, from any act or failure to act by the City of Atlanta or any of its officers or employees, that occur during or arise from the rainwater catchment systems for potable and non-potable uses in residential areas. The building owner understands that he/she is choosing to harvest rainwater for potable and/or non-potable uses at his/her own risk. 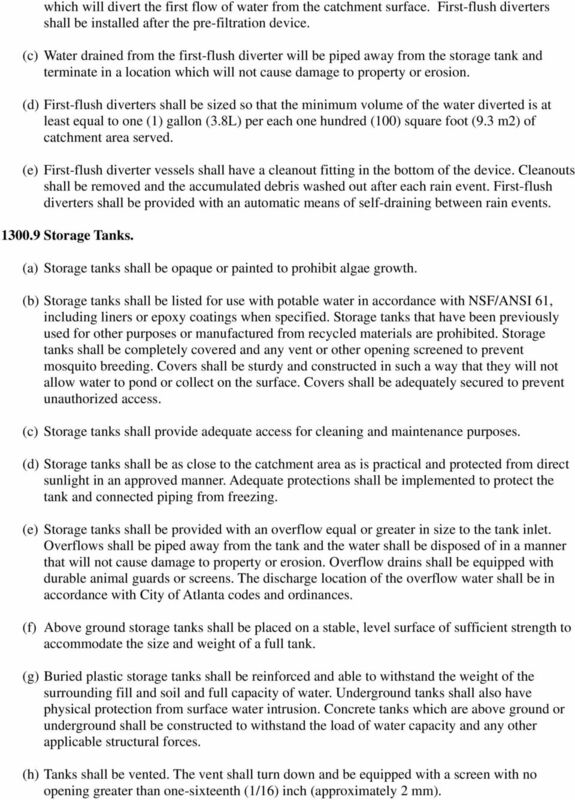 (d) The applicant shall provide an agreement holding the City of Atlanta harmless for liability for the construction and maintenance of said rainwater catchment system, and the owner shall record the agreement in land records of the county or counties in which the property is located that assigns all legal responsibility to the owners for construction and maintenance of said rainwater catchment system System Requirements. (a) Potable rainwater catchment systems shall have chlorination, UV, ozone or iodine treatment. 5 which will divert the first flow of water from the catchment surface. First-flush diverters shall be installed after the pre-filtration device. (c) Water drained from the first-flush diverter will be piped away from the storage tank and terminate in a location which will not cause damage to property or erosion. (d) First-flush diverters shall be sized so that the minimum volume of the water diverted is at least equal to one (1) gallon (3.8L) per each one hundred (100) square foot (9.3 m2) of catchment area served. (e) First-flush diverter vessels shall have a cleanout fitting in the bottom of the device. Cleanouts shall be removed and the accumulated debris washed out after each rain event. First-flush diverters shall be provided with an automatic means of self-draining between rain events Storage Tanks. (a) Storage tanks shall be opaque or painted to prohibit algae growth. 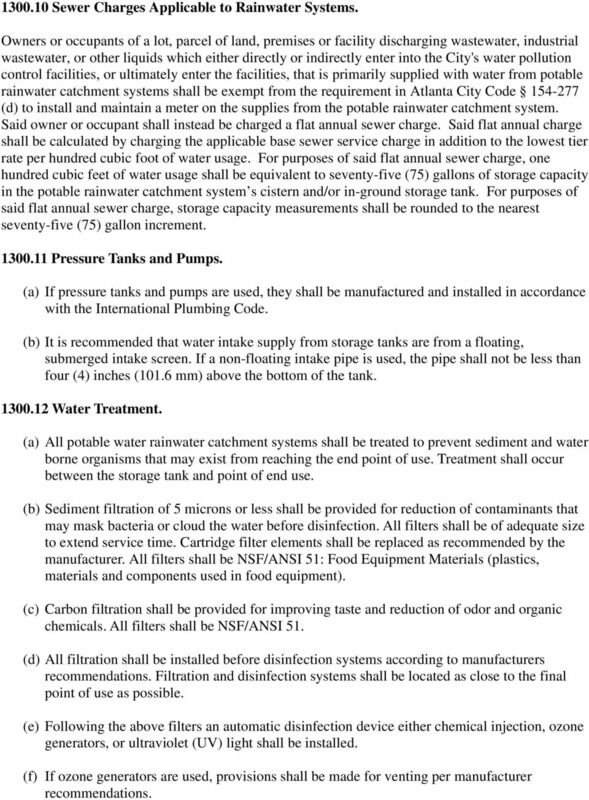 (b) Storage tanks shall be listed for use with potable water in accordance with NSF/ANSI 61, including liners or epoxy coatings when specified. Storage tanks that have been previously used for other purposes or manufactured from recycled materials are prohibited. Storage tanks shall be completely covered and any vent or other opening screened to prevent mosquito breeding. Covers shall be sturdy and constructed in such a way that they will not allow water to pond or collect on the surface. Covers shall be adequately secured to prevent unauthorized access. (c) Storage tanks shall provide adequate access for cleaning and maintenance purposes. (d) Storage tanks shall be as close to the catchment area as is practical and protected from direct sunlight in an approved manner. Adequate protections shall be implemented to protect the tank and connected piping from freezing. (e) Storage tanks shall be provided with an overflow equal or greater in size to the tank inlet. Overflows shall be piped away from the tank and the water shall be disposed of in a manner that will not cause damage to property or erosion. Overflow drains shall be equipped with durable animal guards or screens. The discharge location of the overflow water shall be in accordance with City of Atlanta codes and ordinances. (f) Above ground storage tanks shall be placed on a stable, level surface of sufficient strength to accommodate the size and weight of a full tank. (g) Buried plastic storage tanks shall be reinforced and able to withstand the weight of the surrounding fill and soil and full capacity of water. Underground tanks shall also have physical protection from surface water intrusion. Concrete tanks which are above ground or underground shall be constructed to withstand the load of water capacity and any other applicable structural forces. (h) Tanks shall be vented. The vent shall turn down and be equipped with a screen with no opening greater than one-sixteenth (1/16) inch (approximately 2 mm). 6 Sewer Charges Applicable to Rainwater Systems. 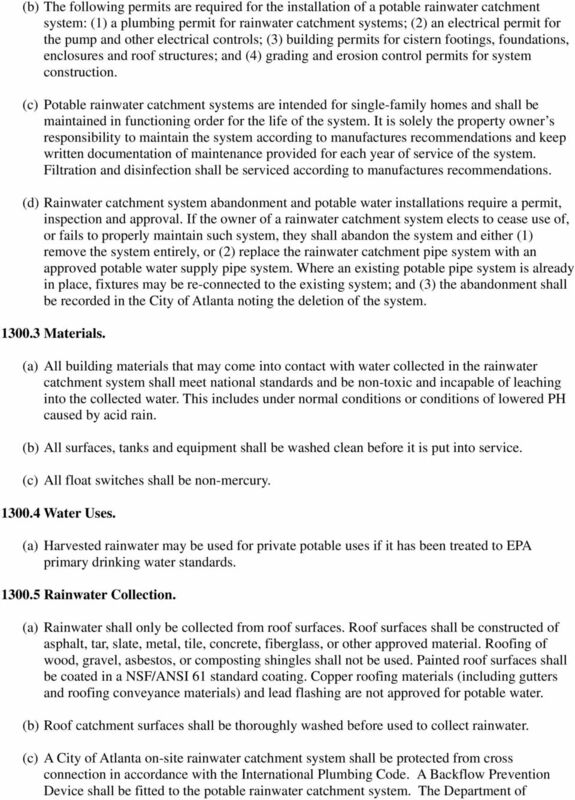 Owners or occupants of a lot, parcel of land, premises or facility discharging wastewater, industrial wastewater, or other liquids which either directly or indirectly enter into the City's water pollution control facilities, or ultimately enter the facilities, that is primarily supplied with water from potable rainwater catchment systems shall be exempt from the requirement in Atlanta City Code (d) to install and maintain a meter on the supplies from the potable rainwater catchment system. Said owner or occupant shall instead be charged a flat annual sewer charge. Said flat annual charge shall be calculated by charging the applicable base sewer service charge in addition to the lowest tier rate per hundred cubic foot of water usage. For purposes of said flat annual sewer charge, one hundred cubic feet of water usage shall be equivalent to seventy-five (75) gallons of storage capacity in the potable rainwater catchment system s cistern and/or in-ground storage tank. For purposes of said flat annual sewer charge, storage capacity measurements shall be rounded to the nearest seventy-five (75) gallon increment Pressure Tanks and Pumps. (a) If pressure tanks and pumps are used, they shall be manufactured and installed in accordance with the International Plumbing Code. (b) It is recommended that water intake supply from storage tanks are from a floating, submerged intake screen. If a non-floating intake pipe is used, the pipe shall not be less than four (4) inches (101.6 mm) above the bottom of the tank Water Treatment. (a) All potable water rainwater catchment systems shall be treated to prevent sediment and water borne organisms that may exist from reaching the end point of use. Treatment shall occur between the storage tank and point of end use. (b) Sediment filtration of 5 microns or less shall be provided for reduction of contaminants that may mask bacteria or cloud the water before disinfection. All filters shall be of adequate size to extend service time. Cartridge filter elements shall be replaced as recommended by the manufacturer. All filters shall be NSF/ANSI 51: Food Equipment Materials (plastics, materials and components used in food equipment). (c) Carbon filtration shall be provided for improving taste and reduction of odor and organic chemicals. All filters shall be NSF/ANSI 51. (d) All filtration shall be installed before disinfection systems according to manufacturers recommendations. Filtration and disinfection systems shall be located as close to the final point of use as possible. (e) Following the above filters an automatic disinfection device either chemical injection, ozone generators, or ultraviolet (UV) light shall be installed. (f) If ozone generators are used, provisions shall be made for venting per manufacturer recommendations. 8 Operations Drinking Water, those wells or other sources of supply shall be registered with the City Bureau of Operations Drinking Water on or before the effective date of this article, and if not measured by a water meter, the owner or occupant shall, at his own cost, install and maintain a meter on the supplies in such a location and in such a manner as is satisfactory to the commissioner. These meters shall serve as a control for the establishment of the sewer service charge and shall be read monthly or bimonthly by employees of the City Bureau of Operations Drinking Water. Rainwater catchment systems installed and operated pursuant to Atlanta City Code Section 1300 of Appendix C Plumbing Code Amendments, Chapter I shall be exempt from the requirements of this subsection. SECTION 3: If the provisions of any section, subsection, paragraph, subdivision or clause of this ordinance shall be adjudged invalid by a court of competent jurisdiction, such judgment shall not affect or invalidate the remainder of any section, subsection, paragraph, subdivision or clause of this ordinance. SECTION 4: That all ordinances or parts of ordinances in conflict herewith are hereby waived to the extent of the conflict. Rainwater Harvesting Demonstration Zilker Botanical Garden HISTORY For centuries, people have relied on rainwater harvesting to supply water for household, landscape, livestock, and agricultural uses. ANALYSIS. BY MARK T. YANAI Principal Deputy County Counsel Property Division. MTY:vn. 07/08/10 (Requested) 10/07/10 (Revised) HOA.730522.